Officially licensed Uncle Fester adult costume from The Addams Family. This costume is perfect for creating the look of Uncle Fester from the Addams Family for Halloween. Costumers and Directors who are doing The Addams Family will often use this costume for Uncle Fester as well. 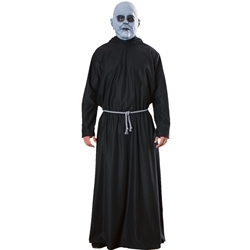 The Uncle Fester adult costume is colored as pictured. Costume includes character mask, hooded robe, and cord belt. For more emotions consider adding an Uncle Fester Easy Makeup Kit instead of the mask.